Last month, I’ve made some press pictures for Steak Number Eight, a Belgian postrock/metal band I’m a huge fan of (they’ve just released an awesome record All Is Chaos, check it out). 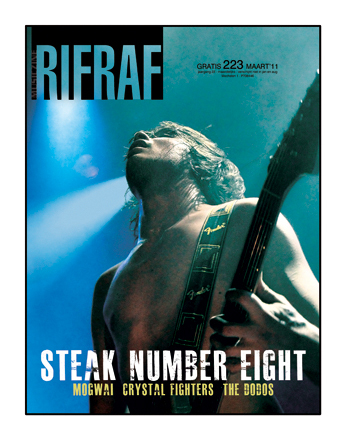 Now one of those pictures ended up on the front cover of RifRaf magazine, no less! I’m totally thrilled, of course. Any publication in the press is nice, but a cover is double so. And another two pictures can be found inside. If you’re in Flanders, you can pick up your hard copy for free in one of many recordstores, concert venues, pubs or libraries. Gratitudes to Steak and RifRaf. This entry was posted on Tuesday, March 8th, 2011 at 1:48 pm and is filed under photography. You can follow any responses to this entry through the RSS 2.0 feed. Both comments and pings are currently closed. Ik kan me voorstellen dat je borst zwelt van trots als je je eigen foto op de cover ziet staan. Ik kan me niet eens inbeelden hoe het zou zijn. Ik vind het trouwens ook een ongeloofelijk coole foto. Luc, merci. zeker, ‘k heb een mailtje gestuurd.